I’m writing this post today from my soapbox. Someone pushed a button, you see, a very large, red “DO NOT EVER PUSH” button, and writing this down is cathartic. So why am I sharing it? There is a difference between being insecure as a person and being insecure about your writing. There is also a difference between being insecure about your writing and being insecure about what other people say about your writing. Insecurity is, unfortunately, part of the writer’s journey and it can be an incredibly crappy thing to deal with. Doesn’t matter if you write non-fiction, fiction, gaming narratives, screenplays, commercials — whatever. You may be proud of something, until someone else gets their hands on it. A reviewer. A professor. An editor. A peer. Some criticism is necessary to make the project better. This? This I’m okay with because a good editor is a diamond in the rough. A good editor will help you look your best — and who wouldn’t want that? The worse, it seems, can come from others within the community or avid readers who prefer one thing but not another. Genre isn’t as good as literary fiction. Speculative fiction is better than science fiction. Non-fiction is good, but only if you’re accredited with the experience and knowledge to write it. Winning an award is good, but only if you win X award. Marketing copy can only be written if you follow the school of thought from X luminary. You’re not a real author until you get optioned for a movie. In order to be considered a serious author, you need to have X amount of books out. You have to be published by New York or you’re nothing. Small press publishers are just amateurs begging for money. Editors are frustrated writers. If you don’t make X amount a year, you’re not really serious about writing. If you can’t write a story on the first try, then you’re a bad writer. What is this crap? It’s meaningless b.s. that taps into some insecurity on some level — but it’s about as useful as a giving a beer to an alcoholic. The worst part about this (which is where the button-pushing comes into play) is that often these comments are not meant maliciously. (Yes, there are some that are…) Most of the time, though, it’s because the person making the comment is damn insecure about their work, you see, and they’re looking for validation by reminding themselves what they don’t like about yours. If you want to know what drives me to write better, to be a better person, to seek out new opportunities and deliver the finest product I can — this is part of that reason. I compete against myself every day not because I’m insecure about my work, but because I will never have written, polished or delivered “enough” quality stories and games. I have had a love-hate relationship with my creative side my whole life, because it took me a long time to find my tribe. You know what I’m talking about. People that will cheer and read everything you publish because they enjoy it that much. A support group. Haven’t hit the proverbial thousand fans yet, but whether it takes ten years or twenty — I’m not going to stop just because someone says I’m nobody or thinks I’m not important enough. To them? Sure. But not to me. Yes, I may idealize the concept of community but the alternative? To be bitter or a drama queen or whatever? I don’t have time for that. I really, really don’t. In a world rife with criticism and negativity, I would much rather compliment and uplift than talk about how great I am and how sh*tty everyone else is. That is not how I roll. In the end, I feel we have forgotten that words — on or off the page — have power. We forget that there is another person on the end of that line. That author? May have the same exact hopes and dreams and wishes that we do. How would you feel if you told someone their work was crappy because it didn’t get published according to your standards? Sometimes, all it takes is for a smile or a kind word to make someone’s day. To me? That’s power to be used responsibly. For writers, words are everything. And with that, I step (carefully) off my soapbox and tell another story. May yours be everything you’ve ever dreamed them to be. And I sincerely and deeply wish that you reap the successes you deserve. I’ve got a hell of a lot of writing to do and, quite frankly, I’m okay with that. I am loving this manuscript and I know someone else will, too. DriveThruRPG.com and DriveThruFiction.com are offering a huge, mega-sale on hundreds (if not thousands) of titles. What’s included? Almost a dozen games and anthologies I’ve contributed to! 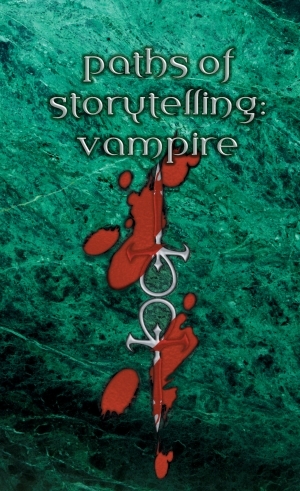 Titles range from new-ish releases like Paths of Storytelling and The Zombie Feed, Volume 1 to older debuts like the Nuomenon RPG, the Aletheia RPG and the award-winning Buried Tales of Pinebox, Texas. Sale ends on Sunday, July 31st. Merry… Summeras? So, right after I get back online, Google+ launches. (Yes, I did slurp up an account.) The whole concept of Google+ is very similar to how we interact in real life, because it effectively creates cliques. Yes, putting people into circles is a form of cliques, whether we want to admit it or not. Quite frankly, I don’t have time to do the deep dive into Google+ because I am taking a wildly different approach to what I want to do online. It has been a lot of fun connecting (and re-connecting) with other authors and whatnot, but the bulk of my marketing efforts are going to start taking on a much, different shape in a longer-term fashion. I’ve been willy nilly on Facebook, Twitter and whatnot the last week, and while my project management is firmly in place, I know I’m going to have to cut back from being a frequent butterfly-er to something a little more manageable. One of the points I talked about, was how content was more valuable than interaction. This post entitled Book Blog Tours and Review Sites with Adrian Phoenix is a great example of how an author used content marketing to attract fans. If you want to know why I guest blog and guest write for so many different sites, this would be the reason. It’s a good article and I’d recommend giving it a read. The other interesting thing, though, was that this article reminded me of something I neglected to mention. That is: micro-communities have been extremely beneficial to me. When I’m on social media, I’m there to either a) share or b) broadcast. It’s one or the other, and I never know who I’m going to reach at the time. The more followers I add? The less confidence I have of reaching them. After managing social media for so many businesses, the data is really all over the place. Not only do you have to worry about what you post — but when. Micro-communities, which for me have taken the form of a publisher’s website or forum, have made one of the best impacts on my career because I’ve gotten to know people and have been more comfortable with the readers that are engaged there. I feel that writing guest blog posts (or doing book tours, etc.) is a form of tapping into these micro-communities. It’s not a generic: “Oh hey, buy my book.” It’s the action of establishing a connection with a pre-existing audience that has a vested interest in that website’s (or forum’s) content. We started offering guest blog posts on FlamesRising.com a few years ago, and these types of posts really help our readers get to know an author. On the flip side, when I release a game that fits the darker genres, I often blog about my game design notes there, too, because that audience is engaged. (Our door is open to authors/game designers who want to write a guest post, provided the book/game is an editorial match for the website. With the over-saturation of the market, some authors are developing micro-communities around their work BEFORE they do any more marketing. I think this tactic is pretty smart, though, I’m pulling back on assertively marketing my own work until early next year. I am still going to guest blog, but I’m not ready to pull the trigger on a full-scale marketing plan right now. There are some things I’m doing behind-the-scenes, so if you want to get the skinny on that be sure to sign up for my monthly newsletter. If anything, though, micro-communities is where an author will have to eventually go — unless they are lightning in a bottle. I’m not banking on Thor helping me out in that arena (Though, if he wanted to… I certainly wouldn’t complain… Would you? ), so my world is getting smaller to balance original with tie-in work and other forms of income. Micro-communities are also valuable for me in the sense that I have a place I feel at home. I have a sense of humor, albeit dry, and humor isn’t always received well online. The more you get to know someone, the better you’ll be received. I mentioned earlier that I’ll be helping out some at the DriveThruRPG/ White Wolf booth this year at GenCon: Indianapolis from August 4th through the 7th. This event is like Christmas in the hobby games industry, for you’ll no doubt hear about many new releases and games that debut at the show. This year will be filled with a few *secret* surprises, good friends and lots of meetings. Even though I continue to write fiction, I feel I have a home in the hobby games industry and it’s because of companies like White Wolf, Eden Studios, Abstract Nova Press and others that I have had a renewed interest in writing genre fiction. Many novelists and short story authors have gotten work published in the hobby games industry including R.A. Salvatore, Elaine Cunningham (who will be the GOH at Geek*Kon in September), Jim C. Hines, Ari Marmell, Jess Hartley, myself and many others. Since this year is an important year for DriveThruRPG and White Wolf, I thought I’d offer you a map to show you where the booth is. If you’ve been to the show in the past, you’ll notice just how different this layout is. 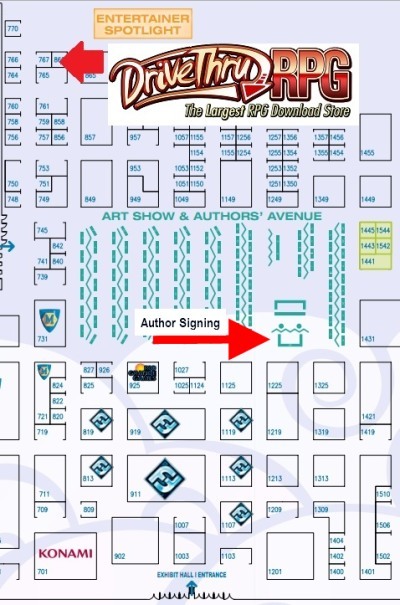 Apex Publications will be located in Author’s Alley as well, so be sure to stop by. The other location I marked is the author signing booth. This year I’m sharing my hour with GenCon GOH Anton Strout. With the demise of Borders, there are thousands of people out of work. Colleen Lindsay, who works for the Penguin Group and is also the community manager for Book Country, Tweeted about a site that’ll offer ex-Borders employees opportunities in their area. (You’ll have to forgive me, I’m not certain if she created the site with the other contributor, Chris Kubica, or not.) You can, however, read: It Takes a Village to Support Out-of-Work Booksellers. Instructions are on the Help Ex-Borders Employees website.